What personality should my blog have? And that's where I think the blogging world has gotten a little lost in translation. You see, the reason why most of the most successful bloggers out there are so successful is because they are real. If you want to read an article, you pick up a newspaper or a magazine. If you want to read a story, you pick up a book. If you want to relate to someone, read a blog. 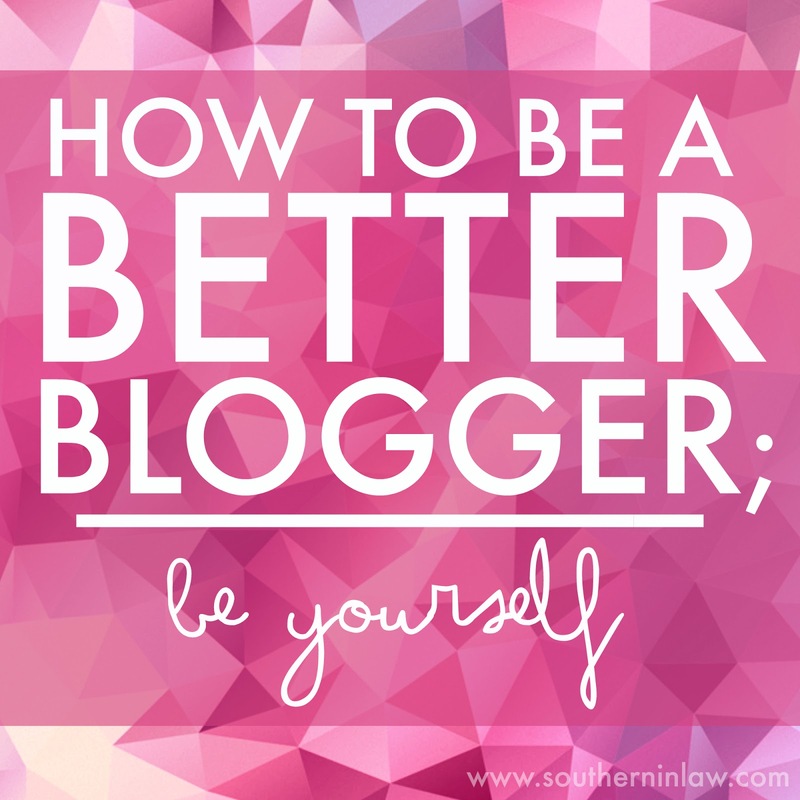 To be a great blogger, you need to be yourself. Whether you have a food blog, a healthy living blog or a finance blog - the reason people are coming to your site to read your posts is most likely because you offer up a personal approach. If someone wants healthy living advice they can google and find an article - but if someone wants inspiration or encouragement from someone else who's been in their shoes, they'll look for a blog. People love real stories. I love real stories - and that's why I started reading and eventually writing a blog of my own. The bloggers who fail after a few months are generally those who have created a "persona" for their blog that's not their own. There's a saying that perfectly explains this; The best part about speaking the truth is that you don't have to remember what you said. It's hard to keep up with a lie - you're constantly fact-checking, chasing your tail and searching for a new story line. When you're sharing your own opinions and own adventures the content is always there! One of my favourite things about blogging is the relationships I've created through it. By sharing myself as I am, I've been able to meet friends all around the world who are just like me or share my interest. Some of my closest friends are those who I've met through blogging! You'll be happier & it will show! If you're being yourself, chances are, you're blogging about what you truly love and are passionate about - and that's what is going to make you happy! Who wants to spend hours upon hours writing about something that fits their "persona" when you can be sharing things you are truly passionate about. Plus, passion is evident! If you're sharing what you love, chances are your content is going to be better received, more thought out and you'll find yourself with more readers without even trying. Right now, I'm a married young woman who owns her own business and has a husband who comes home to binge watch netflix with her every night. When I started Southern In-Law, I was a fiance in a long distance relationship, stressing over visa applications and trying to find her feet in this new coeliac world she found herself in. One day, I'll hopefully be a stay at home Mum trying to juggle kids, work, faith, food and life in general - and I plan on taking you along on that journey as well. When your blog is personal, you have the opportunity to be flexible as your blog will change as you change. Take your readers along with you on your journey - because, chances are, they're on a similar journey themselves. No one likes a copy cat. If you try to make your blog just like someone else's, you're the one who is going to look like a fool. Sure, people like so-and-so's blog - but they probably like their blog because it's unique and different - so why would they want to read a blog that's exactly the same? The reason why the blog you're admiring works is probably because it shows off that person's personality and it's unique to them. Start thinking about what you love and what makes you unique and create your blog around that! There's a lot of pressure out there from society to be someone you're not - whether it be through your blog or what you do in your everyday life - as the world tries to influence who you are. We live in a world that's constantly changing, however, it's important that we stay true to ourselves because that's when we find the most fulfillment from life. If we're constantly trying to "put on a face" we're not going to have time to enjoy life as it was meant to be enjoyed - and we'll someday find ourselves lost, not knowing who we actually are or how we got where we ended up. So, I want you to remember that you make the best you. Cheesy? Yes, but being yourself is going to make you the best blogger you can be! What kind of things make a great blogger for you? And what kind of blogs do you like to read? And if you are being yourself out there in the blog world, leave a link to your blog in the comments! I was just reading an article the other day - an article written by a paper about a blogger and the blogger had just stopped writing but was saying how she didn't want to be a part of the fake anymore. I think that there is a lot of pressure on bloggers to make their lives look like this big ball of awesome-ness and in reality no one is perfect. My kitchen is always a mess, sometimes I run out of time, and other times my allergies get my down and I say I'm not going to blog today and through the to-do list to the window. Sometimes I feel like I abandon the blog but if I tried to power through all the craziness that is life just to get a post out then no one would read that because it wouldn't be a good reflection of myself or the work I want to put out. I like to read real bloggers too - the ones with messy kitchens, failed recipes, and dogs that won't stop barking, and kids who bounce off the walls - because that's the kind of life I live. Ah! Isn't it so silly how there's so much pressure out there to be who you're not! I think it's so easy to feel you have to portray a fake life - but who benefits from that?! Not only are you lying to yourself - your lying to your readers as well. LOVE this Kristy! I know my favorite bloggers are REAL, honest, and their authentic unique selves! Thank you Claire! I love that your blog is real as well!